Have you tried shrubs yet? The idea of drinking something that was made with vinegar is not a new one but can definitely give you pause if you've never tried it. If you're a fan of kombucha, though, you will probably be a shrub lover. So, what exactly is a shrub? It is equal parts vinegar and sugar mixed with fruit and possible flavorings such as ginger or vanilla. The mixture steeps in a jar, in the refrigerator, for a couple of days until the liquid takes on the fruit flavor. It is then strained and mixed with club soda for a supposedly healthy drink. Or it can be used as a mixer with cocktails which may not be as healthy but is definitely way more fun. Shrubs can be made with a variety of different vinegars for different flavors but apple cider vinegar produces a nice, mild result whereas plain white vinegar will likely be too harsh. Pre-made shrubs can be bought in stores that sell high end bitters and other cocktail flavorings. But they're very pricey and making your own is so simple. They even make great gifts. Because shrubs are meant to be consumed with club soda, they make a great base for cocktails that use champagne or sparkling wine. 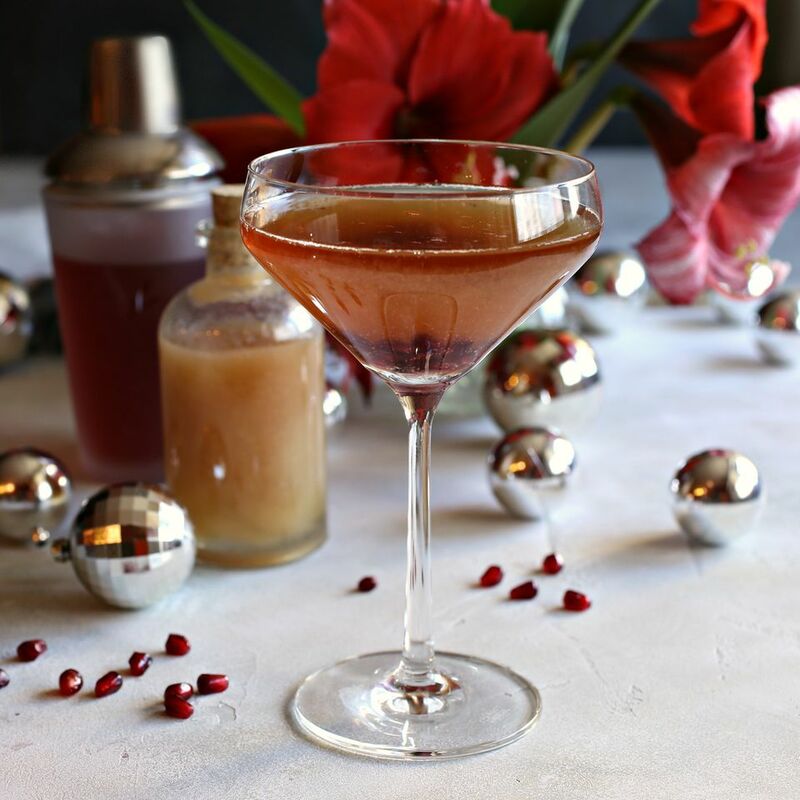 This pomegranate juice and champagne combination gets a boost from a pear and ginger shrub and the result is definitely extra special. Cheers! Combine the sugar and apple cider vinegar in a jar (such as a canning or Mason jar) with a tight fitting lid and shake well to dissolve the sugar. Peel, core and slice the pear into chunks and add them to the jar along with the piece of fresh ginger. Shake well again and refrigerate for at least two days. When it's ready, you can strain out the pear and ginger pieces or, as I like to do, pulse a few of the pear chunks in the food processor, add back into the mixture and then strain. It will give you a more powerful fruit flavor. Keep the remaining shrub, with the lid on, in the refrigerator. It should last for a couple of weeks. Add the pomegranate juice and shrub to a cocktail shaker. Fill with ice, shake well and pour into a chilled champagne flute or coupe glass. Top with the chilled champagne.